Summer 2018 was amazingly long and hot! At The Insurance Emporium, we enjoyed every minute of it! But the high temperatures that led on from a wet winter were bad news for hay and haylage production. We know that, as a horse owner, you always want to do what’s best for your horse. However, with the current threat of a hay shortage leading to rising prices, it could be difficult to know what to do — so we’ve asked our horse health expert for some useful tips on how to ride it out this winter! For most horse owners, mention the word forage and the first word that springs to mind is hay! Although hay and haylage are the most common methods of keeping horses fed, they are by no means the only options. A few alternatives could be straw, chopped dried grass, sugar beet and high fibre cubes. Whilst they might not provide the complete nutrition your horse needs, they could be mixed with other forage. If in doubt, always ask for some advice from a reputable feed company to ensure your horse is getting the right amount of fibre. Manage the green, green grass of home! When you let your horse outside, be sure to do it efficiently so your horse can munch happily away on the grass that is available! You can rotate which paddocks you use so they can get a rest from all that chewing. Other alternatives could be strip grazing, so that your horse only has access to one part of your pasture at a time, or turning your horse out only on alternate days. All of these might help to ensure that what grass you do have goes in your horse’s belly and isn’t wasted! Don’t eat like an animal! Horses may be animals but it doesn’t mean they have to eat like one! 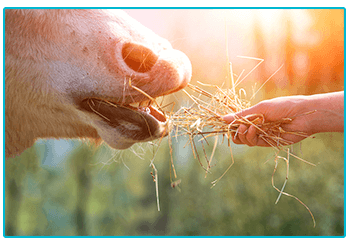 You could reduce the amount of forage you might be wasting by thinking about how you feed your horse. 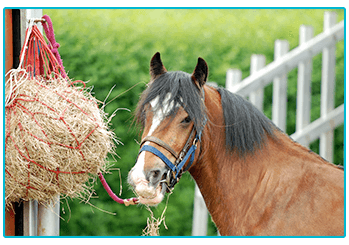 If you’re in the habit of feeding your horse from the floor, why not consider using a haynet? However, if you already use a haynet, perhaps replace it with one with smaller holes. Both of these tips might make your hay last longer and reduce the amount of waste. Dentists are not just for humans! 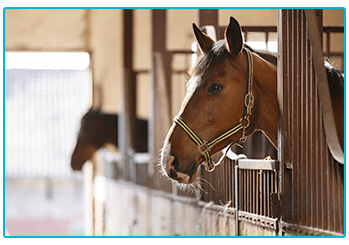 Make sure that your horse is up to date with their dental checks. If there are any problems with your horse’s teeth, for example unevenness or sharp points, it could lead to quidding. This might make chewing really difficult and prevent your horse from being able to close their mouth properly. This could in turn lead to a greater amount of food waste. A healthy mouth could mean healthy hay levels and help put your mind at ease. One of the most important things you might want to do is make sure you plan ahead! Look at different hay and haylage suppliers — could any of them give you a better price than you pay now? It might be a good idea to work out how much forage you’ll need to see your horse through the winter months, and come up with a budget based on this. You could also order in advance, so you can ensure your supplier won’t run out of the stock you need during the winter. At The Insurance Emporium, we know it can be worrying for any horse owner when the threat of a shortage of hay and haylage is looming. Hopefully, these tips will help you plan ahead! If you have any questions about what you should be doing to ensure your horse has enough food throughout winter, you might like to speak to feed companies and your vet for nutritional advice. Also, you could speak to your forage supplier to come up with an idea of what to do going forward. It’s all in the planning — don’t be caught out with hay-fever!